Ominously, this appears when you google image search Etruscan challenge. Ouch. 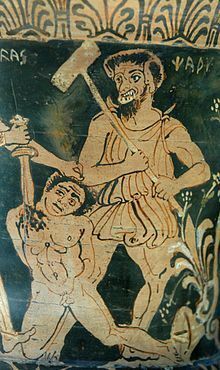 It's Charun, Etruscan death demon, supervising the death of a bound captive. Cheerful stuff. So, in the past I've taken part in the fab Doug Rocks-Macqueen's Archaeology Blogging Carnival, and I'll be doing it this year too. Two posts on this year's theme are coming right up. And what a theme it is. Grand Challenges of Archaeology. The question is, what are the Grand Challenges of YOUR archaeology? Well, to me MY archaeology is my own personal archaeological journey (vomit vomit x-factor language) and Etruscan archaeology (my preciousssssss, in best Gollum voice). So this post is about the Grand Challenges of Etruscan archaeology, or rather, THE Grand Challenge as I see it. The production of new archaeological narratives for Etruscan people's lives. We really, desperately, need to come up with and share new interpretations of the Etruscan past. Time and again, in the past few years, we have seen remarkable developments in Etruscan archaeology. New discoveries of tombs barely damaged or even untouched by tomb robbers, new data coming out untainted by antiquarian excavation techniques. We also have incredible scientific advances: an intricate and carefully controlled study of Etruscan DNA which, for the first time, has some real answers of where these people came from and who they were. At the Milan Expo, Etruscan scholars shared their work through new digital technologies, bringing the Etruscans to a wider audience through 3D reconstructions. Yet some very familiar stories are still kicking around, in and among (and in spite of) these new discoveries, methods and opportunities. The idea of the Etruscans as mysterious and unknowable, a frustrating mirage which obscures these wonderful leaps forward. The idea of princely tombs, linked to monarchial systems of government I've critiqued here before, a conception of Etruscan life which is more akin to a child's tale of princes and princesses than it is to a real evaluation of these people's life stories. These are old ideas with a venerable heritage- we can understand where they came from and why they are compelling. They continue to capture the imagination. In my opinion though, these ideas are no longer an acceptable option for the Etruscological community, and to me it is wrong for us to continue to parrot them to the general public. It is almost ten years since Vedia Izzet (the person responsible for letting me loose on the unsuspecting Etruscans) wrote her seminal text critiquing these interpretative tropes. In that decade, little has changed. Her words remain as cogent now as they were on the day they were written. Perhaps, in the year before the ten year anniversary of its publication, the stories we tell as Etruscan archaeologists might change- we can look again at our data, new and old. We can experiment with ideas from anthropology and philsophy. We can think ourselves a new version of the Etruscan past, using objects and ideas. In this way, we might just be able to catch up with the excavations, the genetics, the technology. That is our grand challenge.